Donor Eggs are required in those cases where the female partner are unable to produce own eggs or the eggs are not of appropriate quality. 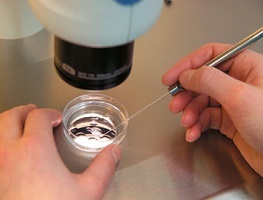 There is an increasing demand for egg donor services nowadays. Who are the candidates for Donor Eggs? Those with decreased Ovarian Reserve due to any cause. Infertility as a result of cancer treatment. What are the criteria’s to select an Oocyte Donor? Must be under 30 year of age. Must be within a normal weight range. Hormone levels must be within normal range. Have no personal /family history of inherited illness or abnormalities. Free of sexually transmitted disease, HIV-1, VDRL, Hepatitis. In addition, their eggs must be of sufficient quality to give recipient the best chance of conceiving. How are the Donor Cycle and Recipient cycle matched? Recipient Gnrh agonist downregulation started. Despite of the shortage of donor eggs, Donor may only be accepted if they meet the rigorous screening criteria. After periods recipients oral estrogens started to make good endometrium. This is given for a minimum period of 12-14 days. After periods donor started with injections for follicular stimulation. Donor oocyte retrieval done at appropriate time followed by IVF/ICSI with recepients husbands sperms. Recepients progesterone started along with estradiol and embryo transfer done. Serum pregnancy testing done 12 days post -transfer.